Child Psychotherapy and Research brings together some of the most exciting and innovative research activity taking place within psychoanalytic child psychotherapy today. 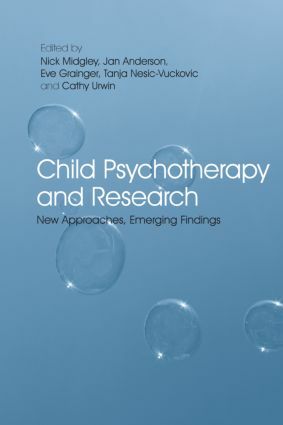 Drawing on the expertise of an international range of contributors, this book describes work at the cutting edge of research in psychoanalytic child psychotherapy and related areas. It presents many of the emerging findings while also illustrating a whole range of methodologies – both quantitative and qualitative – that have been developed to investigate this field. The book examines the historical and philosophical background of child psychotherapy research and shows how research illuminates different clinical phenomena, the processes of psychotherapy, its evaluation and outcome. Recent developments in therapeutic work with children, including the increased focus on evidence-based practice, make research a much higher priority in the field than ever before. With this increasing significance, a whole new generation of clinicians are required to become familiar and competent with research methods and research literature. Child Psychotherapy and Research will be a vital resource for anyone involved in research and training related to psychotherapy and child mental health, as well as of great interest to a range of mental health professionals. Part I What is child psychotherapy research? Research in child psychotherapy: Progress, problems and possibilities? What do child psychotherapists know? Interpersonal relatedness in children with autism: Clinical complexity versus scientiﬁc simplicity?